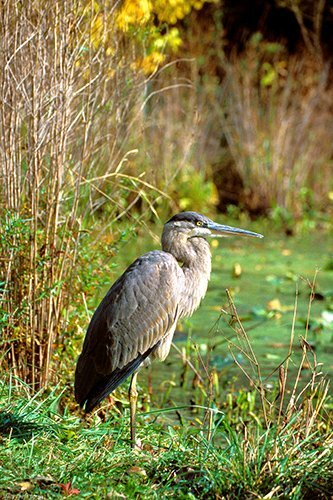 The Abbott Marshlands provide year-round opportunities for viewing and photographing wildlife and plants. The scenic vistas, rich flora, and diverse birds, mammals and invertebrates offer irresistible subjects ranging from landscape to macro photography. The Marshlands’ many habitats are home for 245 species of birds, more than 900 species of plants, as well as many species of fish, amphibians, reptiles, and mammals including a number that are threatened or endangered. There are tidal and non-tidal marshland and forested swamps, and upland forests. Ponds, creeks, the Delaware and Raritan Canal, and the Delaware River are all part of the Marshland’s mosaic landscape. It is possible to observe beavers and their lodges, foraging chipmunks, and sunning turtles. In spring there are carpets of wildflowers, including Trout Lily, Wild Oats, Canada Mayflower, Virginia Bluebells, and Violets. These are followed by the summer-blooming milkweeds, Pickerelweed, Button Bush, and Elderberry. Autumn brings Turtlehead, asters, goldenrods and a dazzling color display of fall foliage and fruit. Butterflies, bees, and other pollinators can be seen visiting the changing array of flowers, resulting in fruits and seeds for the next generation, and providing food for birds and other animals.